The focus on Australia’s history in April and early May with events such as the Frontier Wars March reminds us why the weeks ahead are important. Reconciliation Week will be celebrated nation-wide from 27 May to 3 June to commemorate two important milestones on the road to Reconciliation: the High Court Mabo decision and the 1967 Referendum. On 28 May the ACT will observe a new public holiday for the first time – Reconciliation Day. 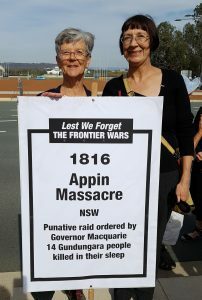 Rita Metzenrath and Janet Hunt were among ACT ANTaR members who joined the annual Frontier Wars March on ANZAC day this year. The march is a peaceful, respectful, and solemn memorialising of all those who died in conflicts between Aboriginal people and the colonisers from the early years until as late as 1934. See our articles page for more details. A conversation between Bruce Pascoe (author of Dark Emu), Bill Gammage (author of The Biggest Estate on Earth), and Ngunawal Elder Wally Bell was held on 9 May. The discussion focused on the legacy and future role of traditional Aboriginal land management in the sustainable use of our rural landscapes. The speakers argued for a revision of pre-European history curricula to include previously overlooked aspects of Aboriginal and Torres Strait Islander society. You can watch a recording of it here. This was a forum for Aboriginal and Torres Strait Islander people caring for country to discuss their experiences and thoughts for the future with others engaged in cultural burning and traditional land management. Speakers included Dean Freeman (leader of the ACT Aboriginal Fire Program), Bruce Pascoe, Oliver Costello (co-creator of FireSticks), and others. More on this to come in an article. As the second in the series of ANTaR ACT Read and Discuss events, Samantha Faulkner and Joyce Graham joined us to talk about their journey as authors and with the Us Mob Writers group, which published the anthology Too Deadly – Our Voice, Our Way, Our Business in 2017. Read the full article here. As an act of reconciliation in the lead-up to the ACT’s first Reconciliation Day holiday, the Legislative Assembly passed a motion on 10 May to recognise traditional custodians at the beginning of each sitting day, in alignment with the federal House of Representatives. On 31 May, Julie Tongs OAM, Louise Taylor, Kim Davison, and Jon Stanhope AO will discuss the progress made toward achieving reconciliation in the ACT. For more information and to register, follow this link. From 29 May to 1 June, the National Film and Sound Archive will be screening movies celebrating Australia’s reconciliation journey. See the full program here. Reconciliation in the Park is a free music event headlined by ARIA award-nominated Busby Marou, along with local Indigenous performers. It will be held in Glebe Park on Monday 28 May, and you can view the line-up here. Us Mob Writers will be sharing their work on 28 May at Smith’s Alternative. They will be reading work published in two collections ‘By Close of Business’ (2013) and ‘Too Deadly: Our Voice, Our Way, Our Business’ (2017). See their Facebook page for more details. A special one-time screening of ‘After the Apology’ will be shown on 4 June at Hoyts Cinema, Woden. “Four Aboriginal grannies challenge government policies to bring their grandkids home. Their grassroots actions spearhead a national movement to curb the skyrocketing rates of child removal.” To reserve tickets (by 30 May), follow this link. It has been almost one year since the release of the Uluru Statement from the Heart outlining a vision for constitutional reform, agreement making, and truth telling. While the Federal Government rejected an Aboriginal and Torres Strait Islander Voice to Parliament, there is still a movement for change and you can add your voice by making a submission to the Joint Select Committee on Constitutional Recognition Relating to Aboriginal and Torres Strait Islander Peoples before 11 June 2018. Tjillari Justice is looking for volunteers to assist in their cultural program run in the Alexander Maconochie Centre on 9 July. If you are interested in applying, please contact Tjillari Justice. The next monthly ANTaR ACT monthly meeting will be on Monday 4 June, at 6pm, in King O’Malleys. All are welcome to talk about ANTaR ACT activities and campaigning. Any queries, please email info@antaract.org.au. ANTaR ACT will be at the Reconciliation in the Park event on Monday 28 May. We will have a stall with that event, rather than have a separate event as flagged in the previous bulletin.